Bloodlight is a word attributed to the Jamaican musician/production team of Sly Dunbar and Robbie Shakespeare referring to the red light indicating that the recording session is in progress. Bami is a kind of grain used for meals that has a particular kind of versatility in the ways it can be prepared and served. The title is an indication of the structure of Sophie Fiennes documentary that switches between primarily between specially staged performances in Dublin, Ireland, and Jones visiting her family and recording in Jamaica. Fiennes first gets the viewers' attention with footage of Jones performing "Slave to the Rhythm". Jones is wearing a stylized skull mask and a loose blue blouse of sorts that extends to a billowing cape, over her form fitting corset. 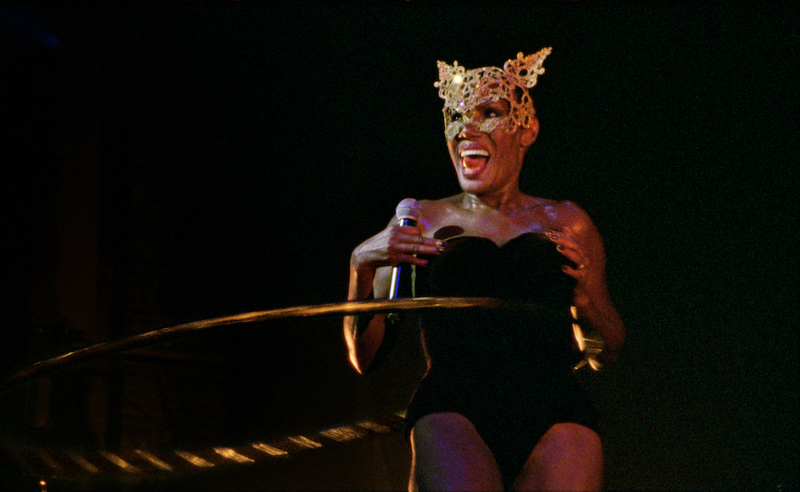 This is cut to alternate with footage of Jones performing the song, with a cat-like mask and corset, while spinning a hula hoop at the same time. With her thin, imposing frame and energetic stage act, Jones looks no different that she did at the time that her celebrity made its initial impact in the early Eighties. I wouldn't be surprised if someone like Beyonce was taking notes as Grace Jones hardly looks like someone who just turned 70. As someone who was only marginally familiar with Jones' music, what is most striking is learning about the autobiographical elements of some of her songs. The family gatherings are in part discussions of the family history, of the prominence of the Jones family in Spanish Town on her father's side, and the notoriety of the Williams family, with Jones' mother considered by her paternal grandfather to be unworthy of Jones' father. There is also much discussion of the impact that Jones' maternal grandfather, known as "Mas P" had on the family. The structure of the film is not linear. Fiennes cuts from one location to another without titles indicating time or place. As Fiennes explains, primarily in the second of two commentary tracks, the film takes place in a continuous present tense. The viewer fills in some of the details through observation and listening. The shape of the film is in some ways similar to Fiennes' earlier Over your Cities Grass will Grow, about environmental artist Anselm Kiefer which similarly observes Kiefer at work, alternating with footage of his buildings and tunnels, letting the work speak for itself. It was Fiennes documentary on Jones brother, Noel Jones, and his church, Hoover Street Revival (2002) that brought Grace Jones in contact with Sophie Fiennes. That Jones was asked previously to be the subject of a documentary, but would only do so on her terms, was the impetus for this collaboration. One of the clearest examples of Jones demanding to be taken seriously and perform on her own terms is in a sequence in Paris. She rehearses her disco version of Edith Piaf's "La Vie in Rose" while surrounded by young female dancers, all dressed in white baby doll lingerie. To describe the staging of the musical number as "tacky" would be too kind. Fiennes manages to find in the audience two young girls, clearly bored with the expression of students waiting for a lecture to be over, surrounded by an enthusiastic audience moving in rhythm to the song. Afterwards, Jones expresses her frustration that someone thought that the use of the dancers was an appropriate idea. Of the two commentary tracks, the first, with Jones, Fiennes and moderator Judith Casselberry, primarily is of interest in amplifying some of Jones' family history. For myself, the second track with Fiennes discussing her working methods with critic Ian Smith was of greater interest. There is also the appearance of Jones and Fiennes at the Film Society of Lincoln Center from last April, with the star even more uninhibited and bawdy than the woman we see on the screen.